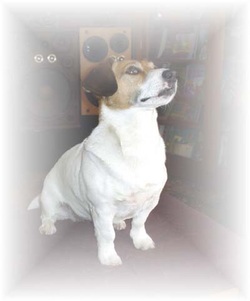 Ace was the inspiration for the Jack Russell Dog Detective series. She was lively, opinionated, busy, and always curious. She loved swimming, and playing ball games of her own invention. We were out walking one day and Ace, as usual, was sticking her nose into everything. "She's a real detective," said Darrel. We spent the rest of the walk planning the adventures of a dog detective! When we wrote up the proposal for the series, we had Ace sign it with a paw print, for luck. It must have worked, because the Jack Russell: Dog Detective series has grown to twelve books, while the spin off series, Pet Vet, has six. Jack Russell is a male, while Ace was female, but one of Jack's favourite words is "ace"! On February 8th, 2006, Ace had a planned litter of five pups. We lost her on February 13th, 2007. She is much missed, and not only by us. Without her, Jack Russell and his friends would never have existed. We feel she is still very much a part of Jack Russell's world, and so she makes cameo appearances in Book 10, The Blue Stealer and Book 12, The Ham Heist. More recently, we borrowed her name for the scrappy little terrier in the Pup Patrol series. One of Ace's pups, Preacher, is pictured on the cover of The Kitnapped Creature.